Your favorite fashion glossies are currently pulling out all the stops as 2017 slowly comes to an end and American Vogue serves up the divine Meryl Streep as its December cover star. The magazine has been celebrating its monumental 125th anniversary since March and the celebrations come to an end with a new ‘Then & Now’ themed issue. Who better than Vogue regular Annie Leibovitz to capture the 68-year-old actress for the occasion? Participating in one of Leibovitz’s signature studio shoots, Meryl looks effortless and at ease in the warm and inviting portrait cover image, wearing a Michael Kors Collection blouse and khaki green trousers. At first, our forum members were in awe. 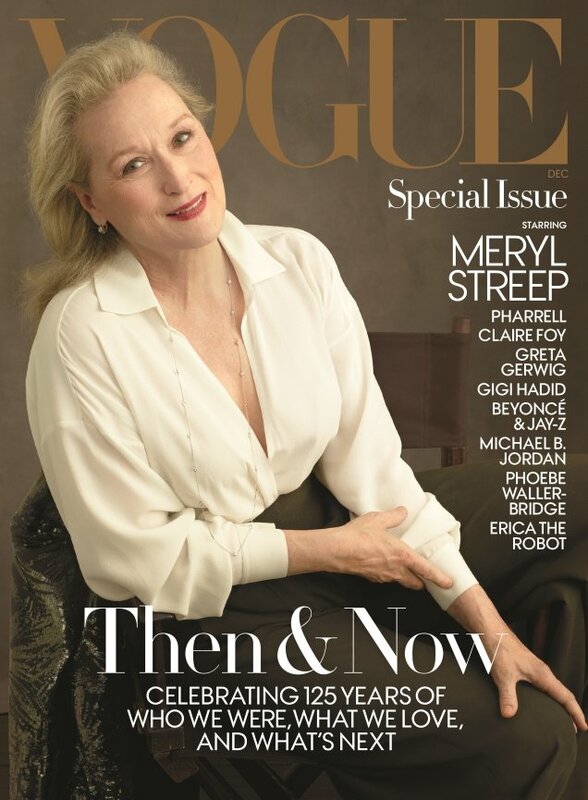 “Beautifully unexpected to see Meryl on the cover. I don’t remember them ever having a woman her age on the cover, love it,” commented Miss Dalloway straight away. “I think when you have such a larger-than-life legend like Meryl on a cover, you really don’t need big styling and production. Just a good portrait and she sells the whole thing by herself. And that’s what they did right here. It’s a perfect December cover,” admired Marc10. “I appreciate the relative boldness of this cover, but it’s so drab! I don’t know…” sighed an uncertain Fiercification. Also feeling slightly underwhelmed by the cover was marsnoop2. “Love Meryl, love that she hasn’t been Photoshopped to death, but this seems like a missed opportunity. This looks so blah, and I’m not blaming Meryl,” she pointed out. “I love Meryl but hate that cover. Vogue NEVER knows what to do with her! Her last Vogue cover wasn’t all that great,” described a far from overjoyed Khabeer. “Absolutely love Meryl, but this is not a good cover,” honeycombchild shared, echoing the same sentiments as the majority. Await what else the issue has to offer and check out Pharrell and Imaan Hammam’s special subscribers cover, here.